Sometimes I try to challenge my self and in this case I tried to imagine one of the more difficult things I could model and render in Blender. I came up with Sushi. Furthermore, I decided that modeling and rendering food would be a fun theme in general. This kicked off a series of renders, of which this is the first. 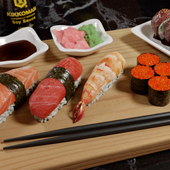 When it comes to 3D graphics, there’s a phenomenon known as the “Uncanny Valley.” Typically it applies to humans or animals, but humans in particular. When you model and render a person, most of the time (especially in the game industry) it’s known and expected that it wont look super realistic. This is the norm. Sometimes, however, artists and developers can push harder to approach photo-real humans. The problem is, as you get closer to realism, it works against you. There’s a “dip” in realism between “clearly unreal” and “photo realistic” where models and renders of humans look uncannily realistic and unrealistic at the same time. If you get too close to realism, things start to “feel wrong.” People can see the render and admit that it’s clearly executed with skill. But at the same time, subtle, almost sublime, details are slightly off. It’s hard to pull-off renders of humans and have them be believable, despite technical expertise. Now, I’m not crazy about modeling and rendering humans. But food is another subject that suffers from the Uncanny Valley effect. As humans typically consume food at least twice a day on average, we have a strong relationship with our sustenance. Considering that food is typically made of organic components, it can be equally tricky to render food and have it be believable. Since I love good food, I thought I would spend some time Rendering various intricate food scenes. I wanted to see if I could cross the uncanny valley., and food is much more fun than rendering people, IMO. As you can see, I have a ramekin of Kikkoman Soy Sauce as well as ginger and wasabi. For the main course I have single pieces of tuna, salmon, and shrimp nigiri, as well as some tabiko rolls and an unagi roll with avocado and crab. 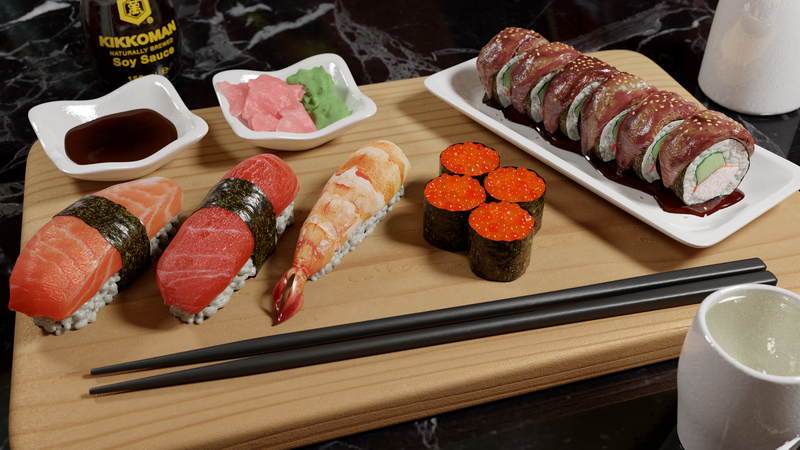 The rice was super difficult, but overall I’m happy with this initial offering in food renders. Incidentally I had been out of the Blender Render game for a minute, since my full-time career switched to engineering. In the meanwhile Blender introduced a new all-in-one PBR (Physics Based Rendering) shader known as the “Principled BSDF.” When I started this render I was using my previous cycles node-based workflow to mix gloss, glass, diffuse and other shader nodes. But with the super handy Principled BSDF I can make much more convincing renders with simpler material node graphs. This makes me happy – leveling up at rendering is always a win. I thank the random Redditors who put me onto the Principled BSF shader!